Ian Scott first heard about Action in Africa while he was an undergrad student at the University of Southern California. Ian helped start an AIA club at USC and then visited The Center in 2016. Ian has maintained staying involved since his visit and even after graduating from USC. Ian shared with us why he loves and supports Action in Africa. Read his full interview with our Executive Director, Sarah Nininger, below! Sarah: How did you first come across Action in Africa? Ian: I first heard about Action in Africa from a friend of mine at school my freshman year, Sarah Chiles. Sarah had grown up with AIA's founder, Sarah Nininger and was looking to start the first service organization at USC focused on volunteering in Africa. This had always been something I had wanted to do, and when she presented the opportunity to start an AIA chapter at our university, I was quick to jump on board. From there it was a matter of gaining membership, advertising the organization, fundraising, and ultimately going to Uganda to volunteer the summer after our sophomore year - still one of the defining experiences of my college career. Ian: I choose to give to Action in Africa and will continue to do so because I have seen first hand the great work it can do and the passion the people who I am entrusting it to have for the community in Nakuwadde. It's easy to write a check or donate money online to an organization and feel good about it without really knowing where that money ends up, but with AIA, every dollar you spend goes to a very real cause. Campaigns like the 100 Reasons campaign allow you to connect the money you're spending directly to a child, a meal, a new library, a dance program, a teacher's salary, or a whole slew of other amazing projects. This, I have found, is unique. Action in Africa is a part of Nakuwadde, and the community there is a part of Sarah and all the rest who help make it such a priority in their lives. Sarah: What is your favorite part of Action in Africa? Ian: The people are my favorite part of Action in Africa. Whether it is the local mamas that come to volunteer, Auntie Janet and the rest that help keep the center running, the little kids dancing and coloring in the main room after school, or the teenagers studying quietly in the library as they prepare for exams, there is something special about the people at Action in Africa. Spend a week there and you'll know. Sarah: Would you recommend Action in Africa to potential new donors? 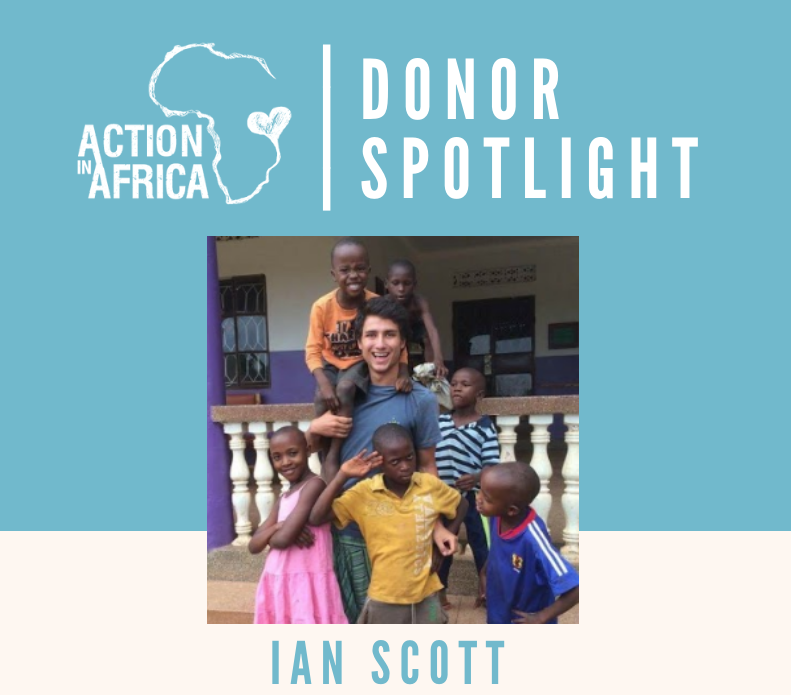 Ian: I would whole-heartedly recommend Action in Africa to new donors - and I do! Every chance I get, I am speaking with friends, family, professors, and coworkers about AIA in an attempt to get them on board. Why? Because I truly believe in it. AIA is not a typical non-profit. The people that work there are realistic, efficient, no-nonsense professionals who want to make a change and have an idea of how to do it. But they experiment as well, they bend to the needs of the community, and they do it with heart. When one of their drivers had his motor-bike stolen, they pitched in with the community to buy a new one. When their first group of students began to graduate from high school, they started a scholarship program to send them to university. They seize opportunity, learn from those around them, and live within the community that they serve. This is why I so happily evangelize AIA. Sarah: Describe Action in Africa in three words. Sarah: Thanks, Ian. Is there anything else you would like to add? Ian: Never underestimate where starting small can lead. Special thanks to Ian for his unwavering commitment to Action in Africa. Join Ian and support our work in Uganda today!